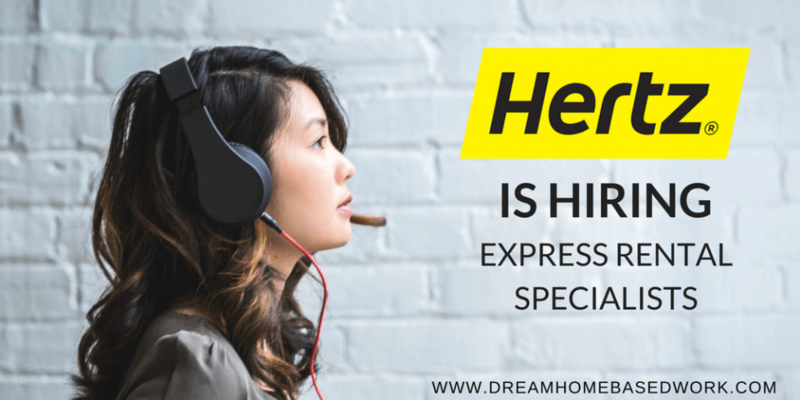 Hertz is currently hiring work from home Express Rents Sales Specialist. The position involves helping renters with vehicle selections and product sells. All positions are full-time with paid training and benefits. The position offers competitive base wage and big incentives based on the revenue generated (with bonuses). There is a guaranteed bonus of $150 after one month, then up to $1100 after the first year of employment. All employees must be available to attend five weeks of virtual training. The hours are Monday through Friday (9 a.m. to 5:30 p.m.). Then after, you can choose between a number of shifts between the hours of 11;30 a.m.- 9:30 p.m.
Proficiency in working with diverse computer applications. Ability to read and understand driving directions and maps. If you are interested in this work from home position, go straight to the job posting on Hertz career page. Don't forget to check out other hot jobs for customer service on our work at home job board. #1 – Talk2Rep is a call center currently seeking work from home Customer Service Reps. The positions involve resolving customer issues, troubleshooting, and research via chat or phone-Read more. To apply, visit their official site here. #2 – GC Services is looking for Home-Based Customer Service Reps. The position involves taking phone calls, assisting customers with accounts and product services. The ideal candidate must have a high-school diploma, excellent communication skills, the ability to multitask, and more. Starting pay is $9.00/hr. #3 – VIP Desk is currently seeking Part-Time Customer Care Reps. –Read more– The position involves working in the HomeAdvisor program by taking customer service calls, scheduling appointments, upselling services, and more. Starting pay is $18 per hour. #4 – LearnDash is hiring Part-Time Customer Service Specialists to work from home. The position involves taking technical support calls while helping clients with the LearnDash WordPress plugin. All applicants are required to reside in North America. #5– Home Shopping Network is currently looking for Customer Care Reps to work from home. at Home Shopping Network (HSN) This is a 100% work from home position that involves taking inbound calls. The ideal candidate must have a high school diploma, excellent communication skills, knowledge of basic computer programs, and reside in the Nashville or Tennessee area. #6 – Way with Words is looking for Transcribers to work from home. The job involves listening to audio and video then typing out what you hear. Schedules are pretty flexible.